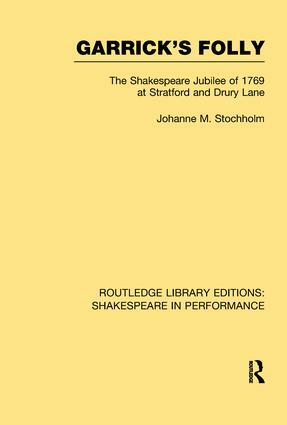 The great Shakespeare Jubilee festival was held at Stratford, under the direction of David Garrick. The occasion was the dedication of the new town hall and the presentation by Garrick of a statue of Shakespeare. Immense interest, enthusiasm, and controversy were aroused by the plans, which involved not only theatrical and rhetorical festivities but fireworks, processions and a horserace. This book was originally published in 1964 to coincide with the 400th anniversary of Shakespeare’s birth. It describes the festival, which touched heights of success and depths of disaster, its impact on Stratford, its after effects in London, especially theatrical London, where rival managers tried to cash in on Garrick’s idea and where Garrick turned the Stratford failure into resounding success at Drury Lane. The author quotes entertainingly from newspapers, memoirs, and plays, and illustrates her book with contemporary engravings and portraits.